Situated to either side of Carp Lake in Shoufeng Township of Hualien County, Chihnan National Forest Recreation Area spans 144 hectares of Chihnan and Papaya Hill forest districts, and ranges from 140 to 601 meters above sea level. Sunny and breezy with a mean annual temperature of 21.8 oC, the humid Chihnan area is an excellent place for outdoor activities in eastern Taiwan. This area is located at the northern end of the Huatung (Hualien-Taitung) valley plain, which is part of the narrow valley fault; Subsequently, there are many steep mountains and rugged terrain around the 601-meter high Carp Hill. On the top of the hill, visitors can overlook Papaya Hill, Central Mountain range cliffs, the entire Coastal Mountain ranges, and the river terrace and surrounding valleys, which are not easy for climbing. There are river-eroded terrains where Tongwenlan creek, a tributary of Mugua Creek, was invaded by Hualien, forming a broad dried valley, and then becoming a natural lake, Carp Lake, after years of water accumulation. Visitors can enjoy a fantastic view if they look down to the area surrounding Hualien River, Mugua Creek, Carp Lake, and Lao River. 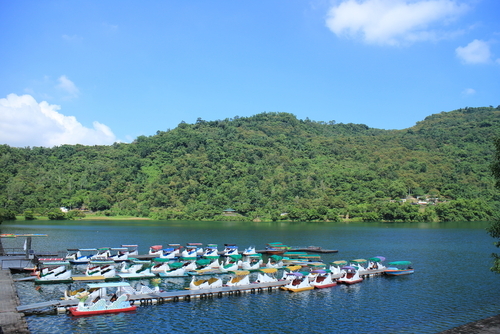 The view of the sparkling Carp Lake and endless hills to the distance is picturesque.